Jordan Manufacturing were pleased to support the Nuclear Supply Chain Meet the Buyer event that was held in Dunblane on 21st June 2017. This one-day event is a mix of presentations by nuclear sector leaders, a business exhibition, networking and pre-booked 1:1 meetings. The event was well attended and allowed the Jordan Manufacturing representatives of David Howorth, Phil Sharing and Ashley Slade to mix with other companies offering services such as civil engineering, fabrication, construction, waste management, demolition and project management services. 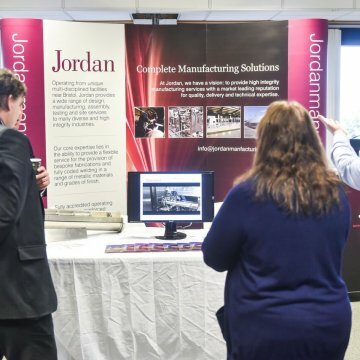 The Jordan Manufacturing team hosted a number of one to one consulatations with companies keen to build a relationship with the company in the future.